It’s hardly rained at all over the past month, but when a good summer rain arrives it usually means we’re in store for a beautiful rainbow. Earlier this week I spotted this one, which arched all the way over Ravello and seemed to dip down into the sea. In Italian a rainbow is called arcobaleno. What’s at the end of your arcobaleno? The biggest event of the year in Atrani takes place on July 22nd when the town celebrates Santa Maria Maddalena (Saint Mary Magdalen), the patron saint and protector of Atrani. The Church of Santa Maria Maddalena, beautiful from every direction, is one of Atrani’s distinctive landmarks. When we arrived for the beginning of the religious procession the sky was turning shades of pink that seemed to perfectly compliment the colors of Atrani. My favorite spot in Atrani is the small piazza in front of the church, where you can get a good view of the distinctive 16th century bell tower and the white facade, perhaps the only example of Rococo architecture on the Amalfi Coast. I love the contrast of the undulating and ornate facade with the stark and more severe stone used in the bell tower. From this tiny piazza is one of the most extraordinary views of the Amalfi Coast looking toward Maiori and Salerno. At sunset it is perfectly dreamy! I got up to the piazza, a bit breathless, just as the procession with the statue of Santa Maria Maddalena was leaving the church. Here’s a short video where you can see the statue and hear the celebratory music and crazy church bells that only ring like this for the festival of Santa Maria Maddalena. I just love a good marching band, especially the tubas, and the band this year was very good. They were from Montescaglioso (read the tubas), which is near Matera in the region of Basilicata. Usually, the bands come from towns in the area, so I’m not sure how this band ended up in Atrani from so far away! Here’s the procession as it makes it way down the twisting road to the beach in Atrani. Later in the evening, as we headed up the main street of Atrani for dinner, we ran right into the procession again. In this video you can see the statue very well and hear the people of Atrani singing. The evening is capped off at midnight by one of the most extraordinary firework displays of the summer. In fact, I was so taken by it that I didn’t make any videos. Well, guess I’ll just have to go again next summer! Nothing speaks to the heart like the beach where we’ve grown up or spent many years of our life. It becomes something more than just a place to cool off on hot summer days. It is a place that soothes our souls, a place full of memories of picnics, time together with friends and family, and time spent dreaming alone. This week Lisa Fantino from Wanderlust Women Travel has stopped by to share with us about her favorite beach, Long Beach Island in New Jersey. I adore che bella vita in Italia. Don’t get me wrong. Yet, when it comes to beaches, my heart belongs to Long Beach Island in New Jersey. It has been the site of so many great events and great recuperations in my life that it would be silly for me to even think that there is any other beach like home. LBI, or Exit 63 (on the Garden State Parkway) as locals refer to it, is a 19 mile stretch of white sand, crashing waves and bliss for this solo traveler. I discovered this treasure during my college days and have relished every moment on it since then. The Old Barnegat Lighthouse stands watch over the northern end of the island and the closer one gets to the bird sanctuary at the southern end, the closer the lights of Atlantic City come into view. It’s the big city which seems so close but is thankfully far away. During the summer it can take 3 hours to canvas the Boulevard. Families crowd the amusement arcade of Bay Village or the mini-golf course, while everyone from 21+ hits the bar scene. The strip is lined with the old haunts that never die like The Ketch, Nardis and of course, rock ‘n’ roll’s finest, Joe Pops. LBI is the Jersey Shore at its best and not at its worst as some recent entertainment references might lead you to believe. However, I avoid LBI like the plague between Memorial Day and Labor Day. Many people think I’m crazy because the summer is all about your favorite beach but not in this case. I wait until the tourists and daytrippers have left the clean white sand behind and all of the traffic lights along the Boulevard have gone from a steady stream of brake light red to a flashing mellow yellow. Off-season LBI is about autumn thunder and lightning storms on the beach, as the bolts light up the night sky and the waves rock the stilt houses. It’s all about shooting stars so close you can almost reach out and touch them. LBI in the fall is about watching the seagulls stream across the turning leaves at Barnegat Light, where Victorian mansions still dot the sparsely populated end of the island. In winter, there is nothing prettier than watching New Years Eve fireworks sparkle the horizon as snow blankets the beach. In spring, you dust yourself off and watch the island, long closeted for the cold winter, come back to life, as the shops and restaurants come back one by one. LBI is perfection – it is catching a sunset down at the bird sanctuary where evening surfers ride the waves into a wave of purple, rose and gold. I can travel the world but Long Beach Island is where I come to find myself again. Lisa Fantino is an award-winning journalist and attorney and the creative force behind Wanderlust Women Travel and the recently launched Italy destination wedding portal, Wanderlust Weddings. She also writes travel features for MNUI Travel Insurance and blogs as Lady Litigator. You might think that with so many tempting beaches on the Amalfi Coast that I wouldn’t dream of traveling anywhere else to hit the beach in Italy. But I have to admit that the white, sandy beaches of Tuscany have always been alluring to me. Especially this time of year when the massive Amalfi Coast August crowds are just around the corner! Katie Greenaway recently had a weekend escape from the summer heat in Florence to one of Tuscany’s pretty beaches, and today she’s stopped by to share about it with us. I recently encountered an area of Italy that I’ve always wanted to see with my very own eyes. This is the area of Grosseto which is located in southern Tuscany along the western coast. I was fortunate to spend a weekend in the area south of Grosseto near the sea at Monte Argentario. Monte Argentario is a mountainous pennisula that darts off the coast of Italy with two ports, Porto Santo Stefano and Porto Ercole. I stayed on a camping ground just 10 minutes from these ports called Giannella Camping. La Giannella is the name of the nearest beach. It was never crowded and there was always a breeze. The water was calm in the morning, with one wave after another ever so slowly crumbling to the shore. As the day moved on the waves got a bit larger and wind picked up. How blissful to have cool air instead of hot air like in Florence! The sand is the what I am used to. It is the sand that sticks to you and burns your feet without shoes. After a weekend at the beach, I still am finding sand in my shoes and clothes. Life at the beach! I found this beach so relaxing and not at all too crowded, as some beaches are in Italy this time of year. We had our own space and no loud people around us, which led to a very peaceful afternoon of napping under the hot Italian summer sun. Book in hand and just the waves to calm you. It was a great weekend with friends with relaxation as our guide. Katie Greenaway is a freelance travel writer and is the Local Expert of Florence for Nile Guide where she also provides the secrets of Florence on her blog. She writes about her life in Florence on her personal blog Olio di Oliva e Sogni di Vino and contributes to MNUI Travel Insurance with travel articles. Who doesn’t like photographs? Who doesn’t like Fridays? 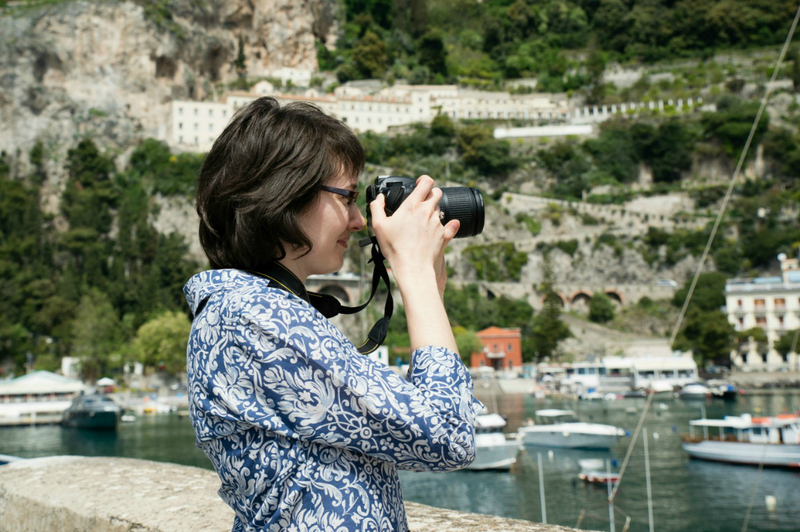 So what’s not to love about a new Amalfi Coast Photo Friday series on Ciao Amalfi?! This time of year it seems I have my camera out just about every day taking shots of religious festivals, summer events, beautiful scenery or fun trips to the beach. I’ll be sharing some of my favorite moments from daily life each Friday on Ciao Amalfi. This week is a shot of the sea of blue umbrellas at the beach in Atrani. I took this yesterday evening after all the beach goers had gone home for the day. There was something pristine and still about the scene. I love the striking contrast between the black sandy beach and the vibrantly colored umbrellas and sun chairs. Last summer I wrote about Atrani’s beautiful beach, but I haven’t been swimming there yet this year. I think I need to remedy that soon!